When print quality, productivity, application flexibility and management simplicity matter, the Zebra ZD620 delivers. Advancing the legacy of the industry-leading GX Series printers, the ZD620 Series desktop printers are loaded with state-of-the-art features. Available in both direct thermal and thermal transfer models, the ZD620 meets a wide variety of application requirements. Designed as a replacement for the GX Series of desktop printers, Zebra’s ZD620 Series desktop printers are packed with pioneering features to advance the legacy of the industry-leading printer. 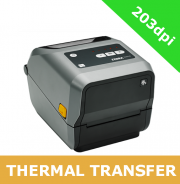 If you're looking for a desktop printer with high print quality, productivity, application flexibility and management simplicity, the ZD620 is the printer for you. The Series includes a full range of connectivity options, the fastest wireless connections and an optional 10-button colour LCD interface that takes all the guesswork out of printer setup and status. The LCD interface allows users to save time and easily see what's needed to keep their printer up and running, from resolving printer issues to replenishing media. 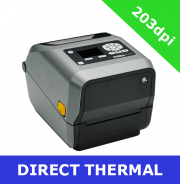 Available in both direct thermal and thermal transfer models, the ZD620 meets a wide variety of application requirements including inventory labels, shipping labels, receive labels, ticketing, product labels, wristbands and prescription labelling. The ease of this means that the ZD620 is simply 'plug-and-play' making it an instant upgrade. Meanwhile, the wide range of connectivity options means that the printer will connect to any existing wired and wireless network - or directly to a PC. The intelligent dual-ribbon handling of the thermal transfer ZD620s allows the ZD620t to accept either 74 m/244 ft. or high capacity 300 m/984 ft. ribbons. The higher capacity ribbon costs less per meter and reduces ribbon changes by 75 per cent for fewer workflow disruptions - a key benefit that marks the ZD620 from the crowd.